One of the most challenging and important goals of the 2025 plan is to end street homelessness in Minneapolis. To do so, engaging the public and educating them on the best ways to make the most impact for those in need is essential. The 2025 plan’s ending street homelessness committee continues to convene a cross-sector of public, private, non-profit and street outreach individuals who are working together to create a plan that will ultimately help reach this important goal. This year, the committee launched a new website, www.mplsgivechange.com, along with a campaign that will help raise awareness about ways our community can pitching. Because of how it is impacting downtown Minneapolis, the Ending Street Homelessness Public Education Initiative was selected as one of this year’s 2025 plan leadership award winners. It will be recognized on October 2 at the mpls downtown council annual gala. 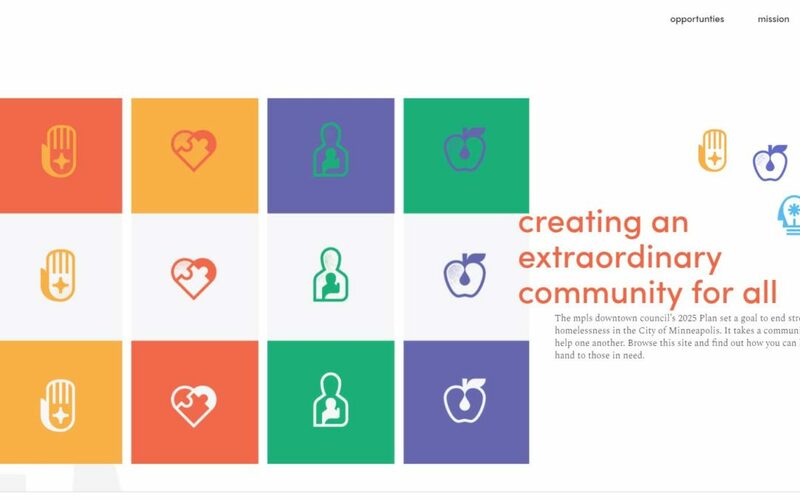 The mplsgivechange.com website is focused on showcasing opportunities for people to engage and most effectively make a difference. This includes giving—not only financially, but giving time through mentoring or helping serve hot meals, donating toiletries or other needed essentials, and more. The website also has a donation function and outlines why it is a more efficient way to give. Not all panhandlers are homeless, and many of those who are experiencing homelessness choose not to panhandle because it feels degrading. One of the more important communication goals in helping end street homelessness is that giving spare change to panhandlers on the street is not the answer. Contributing to proven programs focused on long-term solutions is far more effective. By doing so, your contributions will go toward efforts that will truly help those in need through giving resources for providing homes, delivering social services like drug and mental health treatment, offer job training or meaningful activities to those experiencing homelessness, and more. The website donations go toward initiatives in our community that will help work toward ending street homelessness. Past donations from the ending street homelessness committee have gone toward YouthLink street outreach expansion, St. Stephen’s Human Services’ engagement protocol, Hennepin County Library’s Teen Tech mentor program, and Avenues for Homeless Youth’s housing stability/eviction protection fund. This initiative is continuing to bring people together to work toward this important goal. With continued efforts to educate the community, the committee hopes it will make strides toward ending street homelessness by the year 2025.